Park Square Theatre is conveniently located on the pedestrian mall that runs from St. Peter to Wabasha, between 6th & 7th Streets. We are across Wabasha from the World Trade Center. Due to a major water main construction project, there are currently lane closures on St. Peter Street and westbound 7th Street. Please plan additional time to accommodate traffic delays and find parking in the area. Additional details available at stpaul.gov. Take 94 East to the 10th Street exit. Go right onto St. Peter. Seventh Place is 2 1/2 blocks ahead on the left. Take 94 West to 6th Street exit. Follow to Wabasha. Turn right onto Wabasha. Seventh Place is 2 blocks ahead on the left. Take 35E South to the Wacouta Street Exit. Follow Wacouta to 6th Street and take a right. Go right onto Wabasha. Seventh Place is 1 block ahead on the right. Take 35E North to the 11th Street Exit. Take 11th Street to St. Peter St. and turn right. Seventh Place is 4 blocks ahead on the left just past 7th St. Meters are available on St. Peter and Wabasha Streets. Downtown parking meters are enforced Monday – Saturday, 8 am – 10 pm. Please check the meter for the most current rate information and time limits. They vary by location. For complete information, visit the City of Saint Paul website. Saint Paul has a Parking Meter Mobile App! You can now use your phone to pay for metered parking. The Passport Parking app, which is available for free on Android and Apple iOS, allows you to enter your space number and pay for parking with a credit or debit card. The app also allows you to add more time to their meter remotely, and sends reminders when the meter is about to expire. You can also access the service through the company’s website at https://ppprk.com/park or over the phone 651-571-4037. Parking at meters is FREE on Sundays. 24-hour daily access, unless otherwise noted. Hours subject to change without notice, for further information, please call the ramp directly. All ramps are wheelchair accessible. 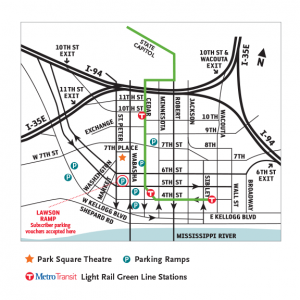 Use the Metro Transit Trip Planner to find the best route, or, you can phone Metro Transit at 612.373.3333 for more information. 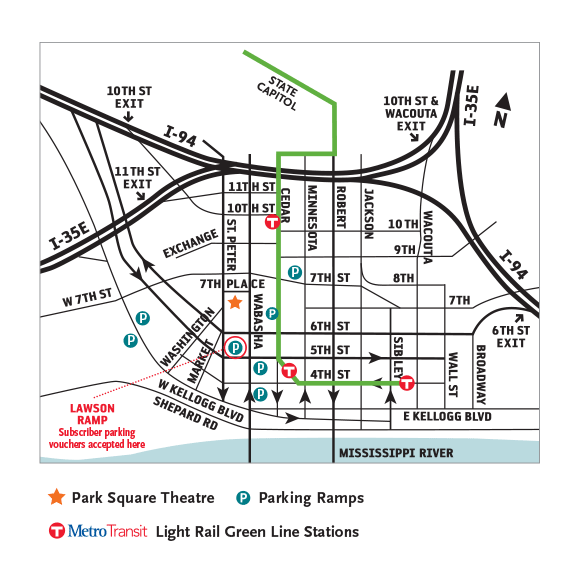 The Metro Green Line St. Paul Central Station is conveniently located just 2.5 blocks from Park Square Theatre. There are connecting bus routes and free Park and Ride options available across the Twin Cities. Bus stops are located at 5th and Market Streets in front of Landmark Center, or at 6th and Washington Streets behind Landmark Center, depending upon the direction you are traveling. Routes 21, 51, 63, 65, 69, 70, 94, 191, 265, 275, 294, 353, 361, 364, and 54D are all accessible to Park Square Theatre. Metro Mobility Service (ADA Paratransit Service) is available for people who are unable to use regular transit routes because of a disability or health condition. Need a taxi waiting after the show? Simply let our House Manager know and we will call a cab for you and having waiting for you when you leave the performance.